You can place a pool on a wooden deck if the construction takes into account several factors. Of course, pools are very heavy. And a lot of water will be splashed, poured and dripped on your wooded deck, potentially weakening it over time. Finally, water moving around in your pool creates a lot of swaying and stress on a wood deck. Construct a deck that can hold up to the weight and stress of supporting a pool. Building a deck to hold a pool takes a little extra planning. Make sure your deck structure is sound and very strong. A simple deck of some 6-by-1 slats over a few 2-by-4 joists will not do the job. Your deck should be built with a minimum of 2-by-8 joists spaced no more than 12 inches across the breadth of the deck. Ten-inch 2-by-10s are preferable. Supporting foundation piles must be 4-by-4 marine-treated lumber secured in at least 8 inches of concrete footing. Remember, the deck will hold not only the weight of the pool but also the stresses of moving water. To account for lateral stresses, X braces should be installed at 12-inch intervals between the joists. This will prevent the joists from flexing side to side when a large amount of water moves in the pool. Finally, flooring for your deck must have even space between the floor planks so the water can adequately drain. Water must drain proper from beneath the deck into the yard or some other open area. Standing puddles under a deck not only can cause wood rot to the footings but also are places for mosquitoes and other insects to gather and multiply. If possible, use marine-treated wood for your deck's construction. This wood is used for building piers and docks in both fresh and salt water. Once completed, annually seal the deck with a quality wood-seal coating. Also, if possible remove the pool every fall when swimming season concludes. This allows the wood beneath the pool to dry completely and to be sealed before using the following season. A deck surface must be kept clean and checked for splitting or splintering, to protect bare feet. Even the best-sealed marine-treated wood can still take in some water and lead to wood rot. Also, any time your deck is damaged through use, such as dropping a heavy object that splits the wood, allow the wood to dry, sand and seal the damage. All standing water will need to be channeled and drained away. 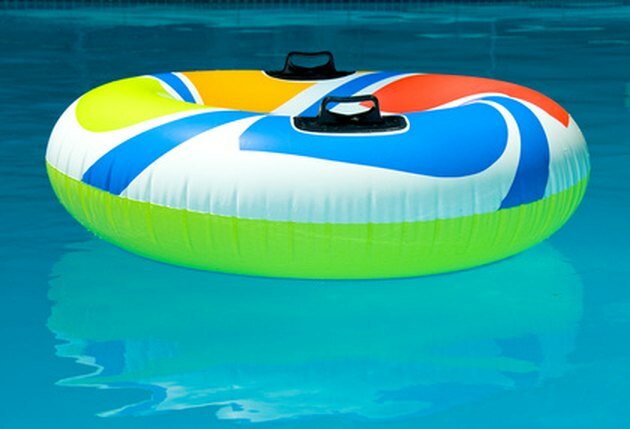 Is It Safe to Put a Child's Pool on the Deck?